On a hill between the villages of Asira al-Qibliya and Urif (south of Nablus), a young Palestinian man was driving his car on Tuesday 9th September. Inside the car was his wife and their small children. At around 7 pm Israeli occupation soldiers stopped the car, ordered the man out, and kidnapped him for interrogation among the olive trees. They ignored the man’s brother asking them to release him for he has done nothing wrong. As shabab [local youth] started gathering to defend the young Palestinian from the occupation army, Israeli soldiers aimed a rifle at the man’s head from zero distance and threatened the shabab they would shoot him if they threw stones at the soldiers. Israeli occupation soldiers then shot numerous rounds of tear gas at the shabab and finally left, although residents saw them hiding among olive trees in the area until late night. Locals later said they had witnessed the soldiers drinking (possibly alcohol) right before they kidnapped the young Palestinian and used him as a human shield. In the morning of the same day, residents of Asira observed dozens of Israeli occupation army jeeps on top of that same hill, stationed for the ‘security’ of USAID and PA officials who attended the opening of a USAID-financed water project for the neighboring villages of Asira, Madama, and Urif. The water network is supposed to bring piped water to the villagers’ houses to replace the expensive rooftop water tanks that have to be bought on a regular basis. As of late evening of 9th September, many villagers still have no running water in their homes. Before that, in the early morning, 6-7 Israelis dressed in civilian clothes (but with army hats and bullet-proof vests) entered the village on foot and started taking photographs of certain houses. When asked by a local what the purpose of their uninvited visit was, they replied they were ‘journalists’. However no villager has heard about them or their journalism before or since. 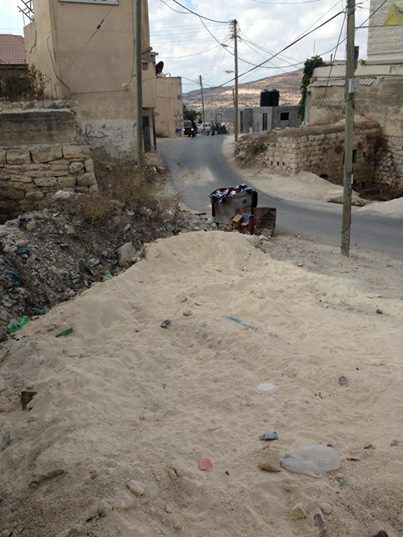 Israeli occupation army (further down on the road) in the center of Asira on Monday 8th September 2014. 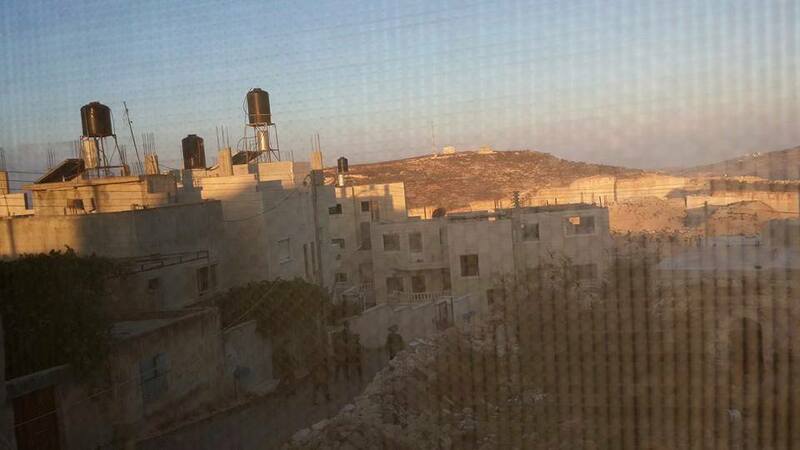 Israeli occupation soldiers photographing houses in the village of Asira on Monday 8th September 2014. Such attacks against the neighboring villages of Asira, Burin, Urif, and Madama have intensified in the last couple of weeks. Night raids, flying checkpoints, road closures, kidnappings, and – in the case of Burin – a violent attack on a school during the classes – have all been repeatedly imposed by the Israeli occupation army. Photos and video from Asira al-Qibliya Facebook page.